Sled Fest 2019. Saturday April 27th. Deluxe photoshoots with Michael Bann of Devilbliss Studios and Claire Marie of Neon Lady Artistry. My 5th year shooting at SLED FEST! Beyond that it’s actually my 8th time shooting there. 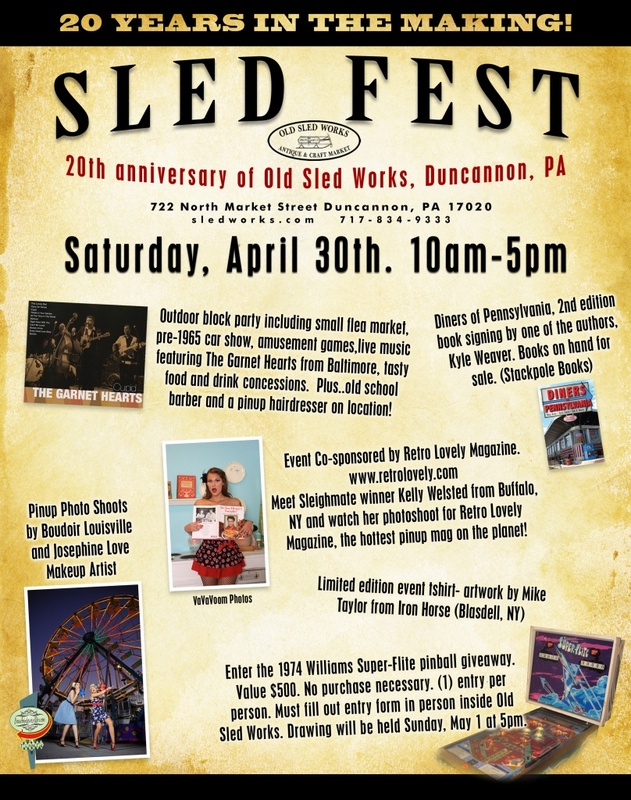 I am actually responsible for convincing Old Sled Works owner Jimmy Rosen to permit pinup photography there and am one of the components that helped Sled Fest come into being. AND WE’RE AT IT AGAIN! Very limited sessions available. ONE is already spoke for. This will sell out well in advance of the date so if it’s been on your bucket list do not wait. 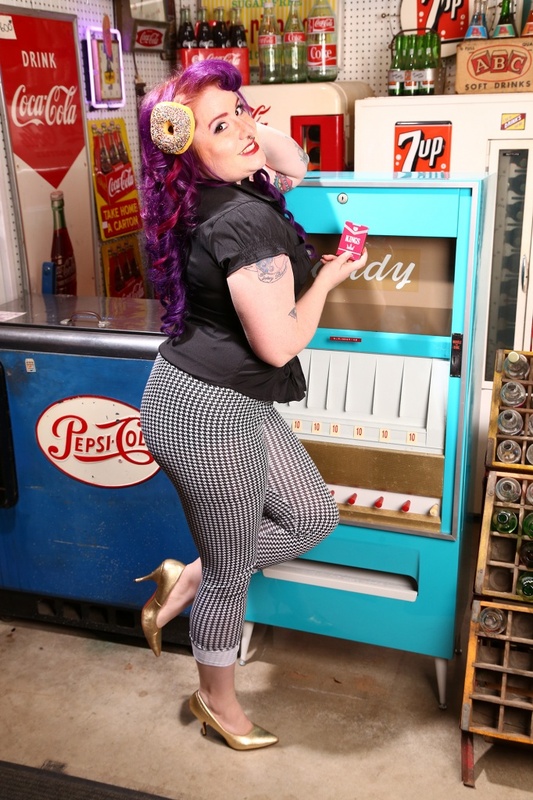 Session is $395 plus tax and includes full MUAH by Claire Marie of Neon Lady Artistry plus n hour shooting with me at the Soda Fountain at Old Sled Works. You go home with ALL YOUR PHOTOS. I capitalize that but it’s important as recently and ongoing I have had clients of mine who have shot with other studios get a bit of sticker shock when they realized their session was just for the “sitting” and that it cost several hundred dollars more just to actually GET some of the photos. YOU WILL OWN EVERY IMAGE and GO HOME with them on an SD data card. What’s more is the session includes 6 CUSTOM edited images. I say custom as there are a lot of studios who will include a few dozen edits they call fully edited but in the same breath won’t let you have the originals, nor request things YOU want edited… without seeing the before photos how do you know what work they did? My custom edits mean you can ask me for specific things you want addressed in the photos, like fixing some rouge wardrobe. Or some hairs that simply could not be tamed or maybe the angle of your favorite pose made your arm look much bigger than it actually is. If I can edit that and provide a natural looking image for you I will. YOU TELL ME. I work for you. AND my editing turnaround time is approximately 48 hours. This is also big. I can’t tell you how many times I’ve heard models mention to me and openly that weeks and months pass until they get their edited images. This is a “thing” for me. You WILL NOT WAIT for your edits. Wardrobe is not provided for our on-location sessions, however, if you are able to visit the studio before the shoot you are welcome to choose an outfit that can be set aside and taken for the day of your session. Shoot deposit is $200. 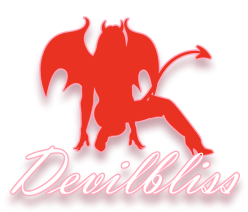 Location session fees are non-refundable or transferable to or from other sessions offered by Devilbliss Studios Edits are based per person in a photo. If friends book sessions together and request edits with 2 or more people each face counts as one edited image. Ready to book your session? Click this link! Form for this session launches in a new browser window.